Trail UpdateNot Much Trail Left-Indeed, as the previous post states, road 4N11 from the boys camp to Vincent Gap is open and in great shape. Alas, that is where the work to fix damage has stopped. The Manzanita (High Desert Trail) is a mess. Now I know that even in it best days this trail was always known for having loose sections and lots of rocks in the trail. Add into the mix the acorns and this was a trail that you had to pay constant attention on. Well currently about 1/3 of the trail is still like that. And that part is quite enjoyable. It is the other 2/3rd that have changed, and not for the better. 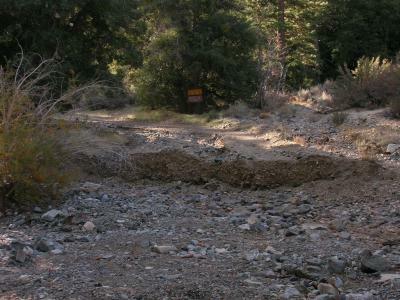 Much of the trail has been washed out and is not rideable no matter how good you are technically. Not fun at all in these sections. The other third is so loose you cannot ride on it as it slides away under your tires, mixed with scree that has consumed huge sections of what used to be the trail. As we walked through these sections the dirt immediately consumed our foot prints and there was no evidence that we had come through. Again no fun going through these sections. The last 1.5 miles into South Fork Campground are the best part of the trail and is quite fun. This trail is no longer worth the drive. Until many man-hours are put into restoring the trail to previous (and those are not ideal) conditions I would not recommend riding here. Luckily we went to the area to ride the Blue Ridge D and had some energy left over so we did this as well, so the trip was not a complete waste. The Blue Ridge D by the way is in great condition and well worth the trip. And the trailhead is only a few miles from Vincent Gap. Head over there instead. Trail UpdateBRC Road Repaired-The Big Rock Creek Road has been repaired between Camp Fenner and Vincent Gap. It's a bit soft due to fresh grading and lack of traffic, and will probably be that way until it opens in spring. However, they did screw up and failed to realign the road right where it is most vulnerable to flooding. No word on conditions on the Manzanita...my ride was truncated by a day-long blizzard. Trail UpdateDeteriorating...-The conditions for Manzanita are deteriorating, and it appears that the USFS has permanently closed the Big Rock Creek Road between Camp Fenner and Vincent Gap (the 3 miles of dirt road). The road was never repaired after last spring's avalanches and flood damage, and has sustained further severe flood damage since then. The locked gate that used to be above the Big Rock Creek CG has been moved to the start of the dirt road at the Camp Fenner baseball field. The upper end of the dirt road at Vincent Gap has been blocked by huge dirt berms outside the gate. Not only does this complicate any potential vehicle shuttle, the road is so bad that walking is required for about 1/3 mile on the climb up to Vincent Gap. The Manzanita Trail is also in pretty bad shape. Some of it is still very sweet, but there are enough damaged and neglected sections that now more walking is required than even before the USFS 'improved' the trail a few years back. In short, this ride really isn't worth it anymore, unless you're prepared to walk a lot. ...but, seriously... Mostly it's great, only a few dead trees, the snow has probably melted out already. Trail UpdateUpdate?-Does anybody know the trail conditions? Planning to ride this trail some time next month. Thanks in advance for any help. Trail UpdateSome Snow Left-Rode east out of South Fork Campground this Saturday because I thought the warm winds of the last two weeks would have melted the snow off the top of the trail - WRONG. The uppermost 3/4 mile of the trail is six inches to a foot deep in snow, but the lower section was a nice ride. I saw two deep, old skids on the trail, one ending in a tree stump and the other continuing right off the trail. If you descend this trail without previewing it by riding UP it, be aware that many sections are loose gravel over a talus base, and traction is kinda iffy. Sections of the trail are invisible under pine cones and fallen branches, and you'll be pulling sticks out of your spokes a half-dozen times. 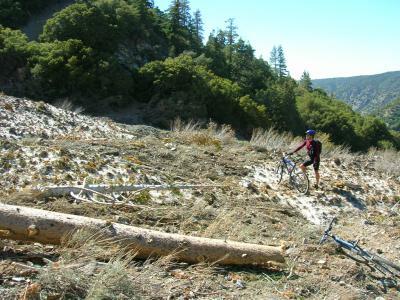 Finally, the area is home to bears, and some of the big brown piles on the trail are neither rocks nor pine cones, and should NOT be ridden through. This is not a downhill run, but a rather isolated trail with no traffic noise, unlike the front-side trails. Delightful, in my opinion, but I'd advise waiting another two weeks before riding it to let most of the remaining snow melt away. Did the Manza on Saturday (4th Nov) and mostly had a good time, but recent storms and misguided humans have destroyed a fair portion of this once-excellent trail. 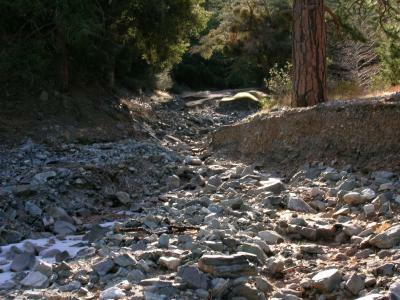 Most of the upper section is the same as ever, except one of the smaller stream crossings has been completely wiped out by a large flash flood. By far the worst damage has been caused by misguided humans - the Forest Disservice has 'graded' the lower mile (above South Fork CG) with a Bobcat front-loader! The trail is now nearly a road, and all of the technical goodies have disappeared. The nice jumps on the smooth switchbacks have been dangerously 'accentuated' and can no longer be hit at speed. Many trees will probably die, as the blade of the beast sheared off literally tens of thousands of important roots on the uphill side of the trail. I saw several oaks and pines that are ready to fall out of the mountainside. Lastly, I fear that the 'improvements' are an attempt to court ORV users, as has been the case elsewhere in the Angeles. This is what the Adventure Pass does, folks! Trail UpdateManzanita Trail, Pan-handled Loo-Rode the Vincent Gap and Devil's Chair seg's of the Manzanita this past Saturday. Looks like there hasn't been much bike traffic this year. Some spots are a little rocky, others covered deeply in acorns and leaves. No snow yet, but there was some ice up by Vincent Gap. I was hoping to see a bear (saw two last time I was here) but no luck! ride the way it was meant to be. Not some wanna be. Trail UpdateWARNING!-If you are not an adventurous person, you are just looking for a smooth place to ride, or are at all unsure of your level of physical conditioning, then DO NOT RIDE THIS TRAIL! On the other hand, if you crave solitude, variety, balls-out tough stuff, wildlife viewing, spectacular scenery, tricky technical riding, and you aren't scared of a little work, then THIS RIDE IS TOPS! Sorry you had a bad time, Mike. Next time, try the velodrome. Trail UpdateWe did this trail starting at the junction of Big Rock Creek Road and the South Fork Campground Road, up Big Rock Creek to Highway 2, then down Manzanita trail to South Fork. This is NOT a beginner ride. The road up gets steeper as the air gets thinner. The trail down is beautiful, but technical. Overall, the trail is soft and loose: sometimes it's soft dirt/sand, sometimes its loose gravel/rock. One of our riders fell five times (a new record for him, I think! He's a good rider.) There are several spots on the lower half of the trail where there isn't a trail: the scree slope has washed the trail away. You can see the remains of steel stakes that must at one time have held the trail together, but right now it looks more like something to ski on! Don't miss your footing here! Still, it is beautiful, and could probably stand to have a bit more travel on it. Give it a shot, but keep your wheels on the trail!